Does your dog has sensitive skin? 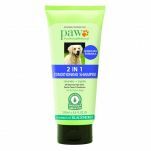 PAW Sensitive Skin Shampoo is developed by vets specifically to suit your needs. This sulphate free, nutrient rich shampoo will keep your dog looking fantastic and feeling fabulous. 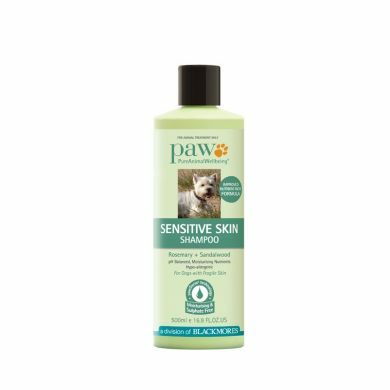 PAW Sensitive Skin Shampoo is a special pH balanced formula for dogs with fragile skin. Dogs skin and hair is very different from ours. Human products are generally too acidic for your dog's skin and can strip your dog's skin of important natural oils. Dogs require different products to maintain healthy and lustrous coats and skin. If your dog has sensitive skin it's very important to choose products with sulphate free cleansers as sulphate cleansers may strip the skin’s natural oils and can be associated with dry, itchy irritated skin. So many dogs suffer from skin irritations which could be avoided with the proper treatments. A specially formulated dog shampoo and conditioner such as these from Pure Animal Wellbeing (PAW) will help enrich your dog’s skin and coat. Specially formulated using pawDerm® technology, All PAW products are sulphate free, highly moisturising and nurturing and complement the pH of your dog’s skin. Recommended by vets and developed in consultation with animal dermatologists, All Pure Animal Wellbeing are naturally gentle on the coat and skin.